Cactus Beach was a stop-over en route from Kalgoorlie to Adelaide, a round trip of 4,200 kilometers (2,600 miles). This was my first ever independent road trip at the ripe old age of 18. The beach is situated off the Nullarbor along the Eyre Highway, 21 kilometers south of Penong in South Australia. Apparently it is well signposted these days but wasn’t easy to follow the myriad of tracks in 1978. You turn off at the Penong School and head south. Set aside a good hour as the round trip takes the best part of it even when you know where you are going! Nowadays many will have a GPS, however, don’t take the trip lightly if you are not familiar with the high temperatures, aridity and distances of the Australian Nullarbor. 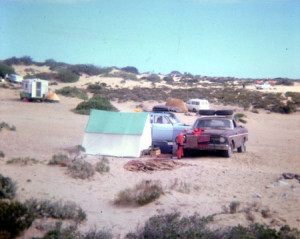 My old XR Falcon ute had no issues, but the Holden hidden behind my the tent had the bonnet removed due to over heating issues. Along with Point Sinclair it has become a bit of a mecca for serious surfers. Even all those years ago there were people braving the rocks and sharks to catch good waves. Without doubt Cactus Beach has it fair share of visits by Great White Pointer Sharks. At least three attacks are recorded, one of them fatal, with numerous sightings. At that time I wasn’t a fisherman or surfer but the approach, environment, isolation and beach itself made for a wonderful couple of days.